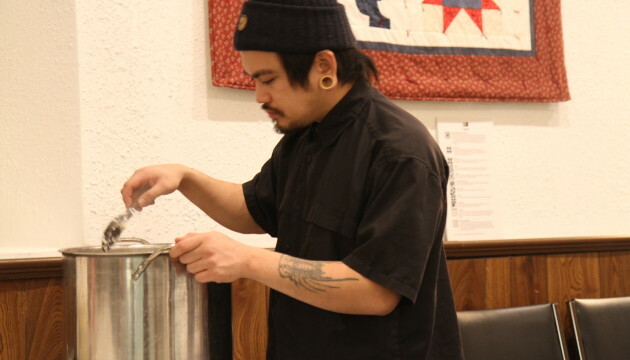 Patrick Cruz's Kitchen Codex as part of People of Good Will, February 2015. Photo by Kade Twist. Kitchen Codex is a food based event, collaborative sculpture and a communal performance. Participants from the local community are asked to donate a personal recipe in exchange for a Filipino dish which the artist will prepare and serve. Using food as a vessel for sharing knowledge and as a means to view personal and collective histories, the collected recipes will be archived into a cook book. Authored by the local community, the completed cook book will both act as a documentation of the event as well as a collective portrait echoing the diverse social landscape within the neighborhood of Guelph, Ontario. Similarly, the Filipino cuisine is influenced and shared by different cultures. The diversity of ingredients and techniques were shaped by neighboring cultures that traded with them and other foreign cultures that colonized the Philippine islands. It is through cuisines that we may begin to examine the distilled complexity between layers of cross-pollinated social, cultural and political histories. Perhaps this act of consumption and exchange could potentially paint a new flavor of awareness. Kitchen Codex aims to animate Guelph Black Heritage Society’s space as a site of exchange for knowledge-based transactions which use personal narratives as currency to stitch and weave a community map. Patrick Cruz (b.1987) Manila, Philippines is a Filipino-Canadian artist living and working in Guelph, Ontario. His work often situates between the personal and the political. Cruz’s practice aims to reimagine notions of displacement, transnationalism and the effects of the global cult. Cruz studied Painting in the University of The Philippines and finished his Bachelor of Fine Arts from Emily Carr University of Art + Design; he is currently a master’s candidate at the University of Guelph’s Master of Fine Arts program.